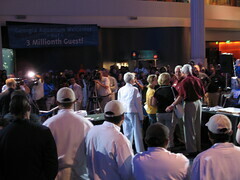 The Georgia Aquarium had its 3 millionth visitor Wednesday morning, and I happened to be on hand. It was my 2nd trip to the aquarium, after an attempt back in January that was cut short because the crowds were just too thick. 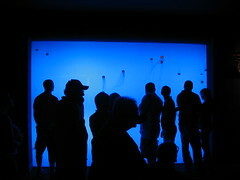 On Wednesday, crowds were much more manageable, and I overheard one of the aquarium workers suggesting that the next week will be pretty quiet, with tourist traffic back up for Labor Day, and then school field trips picking up after the holiday. I have an annual pass that was a Christmas gift, but I'm not sure the experience is worth the $23.75 one-time admission. You can pretty much see everything in a little over 2 hours, and I don't think there's anywhere I would sit and just watch the fish. At the Zoo Atlanta, I could sit and watch the gorillas for hours. Maybe that's just me -- I saw license plates there from New York, Missouri, and New Jersey in addition to the expected Alabama, Florida, and Georgia plates. 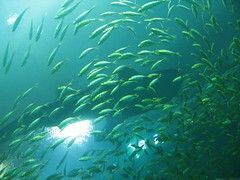 The two big draws are the beluga whales and the whale sharks, which are the world's biggest fish. You pass through a glass-topped tunnel below the enormous tank that houses 4 whale sharks and thousands of other fish, then come around to a 60-foot wide tank window that's the 2nd largest viewing window in the world. Here's a Flickr photoset of the visit. 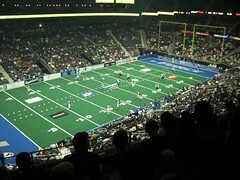 I went to the Georgia Force game Saturday night at Philips Arena. The Force is the local Arena Football League team, and is owned, like Atlanta's NFL Falcons, by Home Depot co-founder Arthur Blank. I've watched Arena League ball on television, but I'm not sure TV does it justice. In a lot of ways, it's like backyard ball: The field is only 50 yards long, and 4-foot-high bumper pads surround the playing field. The goal posts are slightly less than half the width of the NFL's uprights, with a crossbar 5 feet higher than the senior league. Stretching from the uprights to the sidelines are vertical nets that bounce any ball that comes in back onto the field of play, where it's live until it hits the ground. Each team plays 8 players at a time, with about half playing both ways, on offense and defense. There's no punting, and looser rules about offensive motion; one receiver can be running at full speed at the moment the ball is snapped. With all the rule changes, it's almost more like pinball than football. The game I saw finished 61-47. The liberties the league takes with traditional football rules can cause a little confusion. Maybe I'm just not football-smart, but Arizona did something that seemed unbelievably stupid. Twice. 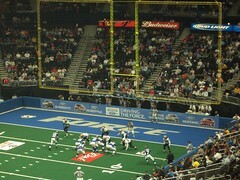 Arena League teams kick off from their own goal line, and typically the kickoff bounces off the backstop nets, forcing the return man to turn his back on the onrushing defenders, grab the ball, turn around, and sprint for a hole. Twice on Saturday, the Rattlers attempted an on-side kick. From their own goal line. Giving Georgia the ball on about the 11-yard line. The new rules also may lead you to come up with your own favorite rule tweaks. My suggestion: If a kicker can put the kickoff through the 9-foot-wide uprights (from 50 yards away) give his team 1 point, and let them kick it again. Take one Best Buy, add a Micro Center, a Radio Shack and a coffee shop, plop it down next to Gwinnett Place mall, and you've got Fry's Atlanta. The geek's choice of big box retailers has come to the Deep South, and I checked it out over Labor Day weekend. About the only thing that kept my wallet in my pocket was the fact that I had just bought a G5 (about which, more later). This is an almost comically big store. I would guess it's 4 times the size of the average Best Buy. There are a lot of things at Fry's you could chase all over Atlanta looking for: electronic components, model rocketry supplies, kites, PC components, digital and analog cameras, TVs of all screen sizes, refrigerators, microwaves, technical books, surveillance/security hardware, and software. They carry a jillion different kinds of flashlight, electronics tools and meters, and the Victorinox Cybertool line, whtich I rely on almost every day. They've got a Mac section, including Apple hardware, a smallish Mac software section, and a reasonable number of accessories; I would place their Mac section roughly on par with Micro Center, and smaller than CompUSA. Prices across the board seemed competitive, but not "so low they're INSANE!" except on their doorbuster specials, which really are amazing. Their ads have been featuring a 250-gig hard drive for $119.99 (after mail-in rebate) this week, a 512-megabyte stick of DDR400 RAM for $59.99 (limit 1 per customer). I saw somewhere that they were selling a Duron 1.6-Ghz system for $99. CD prices looked competitive, but I didn't really check out DVD prices. Looks like a place you could take the whole family; there are a fair number of science toys for older kids, the videos for younger, and the coffee shop if the family runs out of steam before you do. If I were young and single with the freedom to throw away a chunk of my paycheck every week, Fry's would likely take its share. Internet buzz on the chain suggests their customer service is somewhere between average and abysmal, but for a lot of projects, they provide a one-stop resource. My current company is busily building out, and we're looking for Python developers, a dba with open-source experience, and a Linux system administrator. All the positions are contract, on a project-by-project basis. I've posted to the 'comp.lang.python' newsgroup, and expect to see it on the www.python.org Python Job Board any day now. Job Description: Python developers - We're seeking Python developers to help us build and manage a network of electronic signs scheduled to be deployed in U.S. transit stations. Contract work, on a project-by-project basis. - Ideal candidate will have experience interfacing Python with databases and/or with networked devices. - Must be comfortable working solo, or on a small team with minimal supervision. - Strong preference for metro Atlanta residents, because of the need to develop against specialized hardware. Contract position on a project basis. We will consider proposals from software development groups. We will begin interviewing as we receive resumes. Please send resume, link(s) to previous project(s), hourly salary requirements. Chick-Fil-A is keeping their already tiresome Cows/'Eet mor chickun' campaign alive by sponsoring CowParade Atlanta, where artists create art-cows that are placed on display all over the city. Hmm...If only there was a cow that could explain why they would do this. All pictures from my Nokia 3650 camera phone. BlackBoxVoting.org | What really happened in Georgia? Someone at Black Box Voting offers up an interview with someone who was apparently a tech working on the project to set up and verify the Diebold touch-screen voting machines used here in Georgia in the 2002 election. To those of us who have worked in either a) a large corporation, or b) a state organization, it's no surprise that the roll-out didn't come off as planned, but it would seem that a roll-out of voting machines would have a little bit of structure, testing, and security. As far as you can tell from the interview, none of the above were the case. A bug in the code concerning the Windows CE real-time clock affected around a quarter of the machines, so Diebold's programming team took to FTP'ing patches to a public web server (without passwording the directory or the zip file!) for immediate implementation. According to "Rob," the tech interviewed, many of these files hadn't passed through any formal quality assurance process. It's a good thing these Diebold people are politically independent. If they weren't, some people might begin to sense a conspiracy. Seen on Dave Farber's Interesting People mailing list. I'm preparing for tomorrow morning's Peachtree Road Race. I've done the Peachtree, Atlanta's biggest 10k (and the PRRO's national championship race), 5 or 6 times. It's a lot of fun, and an amazing logistical feat, as 55,000 runners, 10+ water stations, and hundreds of portable toilets take over one of Atlanta's busiest streets for a couple of hours. When we lived in Brookhaven, it was amazingly convenient. Up at 6:30 or 6:45, walk down to the start, run down Peachtree, left on 14th, pick up a t-shirt in the park, walk up 10th to catch MARTA at Midtown Station back up to Brookhaven Station. Now I live in the suburbs, and one of the prices I have to pay is getting up much earlier on July 4th. The parking lots at the North Line MARTA stations fill up well before 7, so I have to be there by then. They've also changed the course -- it now continues down Peachtree to 10th Street, turning left to reach the park on a broad, downhill avenue. Unfortunately, that means to get back to the Midtown Station (near 10th and Peachtree), you have to wander through Midtown's residential section, up 8th or 9th Street, then back around to the station. I notice in looking through my race packet that (to encourage runners to stay for the awards ceremony?) the two nearest MARTA stations, Midtown and Arts Center, will be closed tomorrow morning until 10 a.m., when pretty much everyone should be done with the race. If you don't want to stay, there are shuttle buses from Piedmont and 14th to Lindbergh Center, or you can walk on down to North Avenue. If you're watching the race, I'm in time group 5, number 50860. Considering my training regimen, I'm likely to be finishing mostly with people from time group 6.